We all have those days when we're down in the dumps and just can't get motivated. But are you seeing that more often than not at your office? Is productivity beginning to suffer? Does the staff morale need a makeover? There are many simple, but effective techniques you can use to boost employee morale, even if your staff is really down in the dumps. When people are stuck in a rut, you need to break out of the daily grind. Allow them start a little later on Monday so they can tie up any personal loose ends leftover from the weekend and come in focused and ready to turn things around. When people are down, keeping things quiet will only make it worse. Have a daily brief meeting where you can share the actions and progress you're taking to make things better. Do this in a daily circle standing, like a huddle. It creates a natural shot of energy and is better for you than coffee and doughnuts. This is the easy one. It's just two simple words. Say it and say it about something specific and with sincerity. 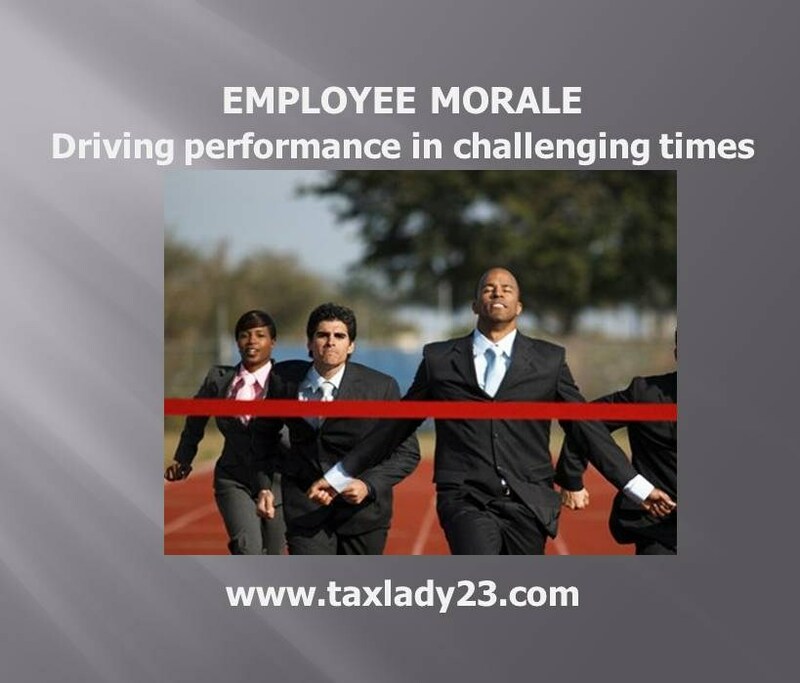 Showing your staff they are appreciated goes a long way in the effort to increase morale. If you're a customer service person you're taught that angry people need to vent before they'll be open to change. Speak with your employees individually or in small groups to share the problems and challenges they're facing. This technique is a considerable step in restoring morale. In large groups it's more likely to get someone on a soap box harping on one problem, which can generate more problems than you can fix, so keep it to smaller more personal groups. Even in the greatest workspace, emotions can decline when the physical environment stays the same. Get your team out of the office occasionally for a unique and different activity, like volunteering for a day at Habitat for Humanity, community food drive or a company fishing trip. While everyone is out, have the office spruced up with fresh paint or floral arrangements with bright colors. The return to a clean bright space may be just the sparkle you need to improve morale. Bringing in doughnuts or bagels for breakfast is a nice gesture, but might not be enough to uplift the mood. Do something different: If your employees sit in front of their computers all day, hire a massage therapist to come in so employees can enjoy quick but revitalizing back and shoulder massage. Or how about hiring a yoga instructor to come in to teach a class for an hour? Remember-Have fun! You don't have to dress in a crazy costume, but you can promote good spirits and enjoyment in the workplace. Go around and talk to your employees. Smile. Acknowledge what they do, for without them, you wouldn't be in business.